The military history of Mexico consists of several millennia of armed conflicts within what is now that nation's territory and includes activities of the Mexican military in peacekeeping and combat related affairs worldwide. Wars between prehispanic peoples marked the beginning of Mexico's military history, the most notable of these fought in the form of a flower war . After the Spanish conquest of Mexico in the 16th century, indigenous tribes were defeated by Spain, thus beginning a three century era of Spanish dominance. Mexico's struggle for independence began primarily in the 19th century, and was marked by internal conflict of early rulers after defeating the Spanish in 1921. The Mexican–American War in the mid 19th century ended in the defeat of Mexican forces, and the loss of two-fifths of the national territory. In the remainder of the 19th century, a series of conflicts began in Mexico, as the War of the Reform and the defeat of the French during their intervention in Mexico marked events in that era. The history of Mexico, a country in the southern portion of North America, covers a period of more than three millennia. First populated more than 13,000 years ago, the territory had complex indigenous civilizations before being conquered and colonized by the Spanish in the 16th century. One of the important aspects of Mesoamerican civilizations was their development of a form of writing, so that Mexico's written history stretches back hundreds of years before the arrival of the Spaniards in 1519. This era before the arrival of Europeans is called variously the prehispanic era or the precolumbian era. Key military campaigns in the early 20th century include the Mexican Revolution and the Cristero War. These two conflicts, respectively, overthrew the dictatorship of Porfirio Díaz and challenged the largely anticlerical nature of the post-Revolutionary governments. Mexico stood among the Allies of World War II and was one of two Latin American nations to send combat troops to serve in the Second World War. Recent developments in the Mexican military include deployment of troops to the United Nations   , a cooperation with the United States in terms of patrolling borders, and relief sent during Hurricane Katrina. In the 6th century, a series of wars between the Tikal and Calakmul erupted on the Yucatán peninsula. The Mayan conflict also included vassal states in the Petén Basin such as Copan, Dos Pilas, Naranjo, Sacul, Quiriguá, and briefly Yaxchilan had a role in initiating the first war. Tikal is the ruin of an ancient city, which was likely to have been called Yax Mutal, found in a rainforest in Guatemala. It is one of the largest archaeological sites and urban centers of the pre-Columbian Maya civilization. It is located in the archaeological region of the Petén Basin in what is now northern Guatemala. Situated in the department of El Petén, the site is part of Guatemala's Tikal National Park and in 1979 it was declared a UNESCO World Heritage Site. Prior to Spanish colonization, in the 15th century, several wars ensued between the Aztecs and several other native tribes. Alliances between the Aztec state and Texcoco had become central to these pre colonial wars. Several of these conflicts were evolved to an organized warfare, known as the Flower wars. In the Flower wars the primary objective was to injure or capture the enemy, rather than killing as in Western warfare. Prisoners-of-war were ritually sacrificed to Aztec gods. Cannibalism was also a center feature to this type of warfare. Historical accounts such as that of Juan Bautista de Pomar state that small pieces of meat were offered as gifts to important people in exchange for presents and slaves, but it was rarely eaten, since they considered it had no value; instead it was replaced by turkey, or just thrown away. Perhaps the most famous of the Native Mexican states is the Aztec Empire. In the 13th and 14th centuries, around Lake Texcoco in the Anahuac Valley, the most powerful of these city states were Culhuacan to the south, and Azcapotzalco to the west. Between them, they controlled the whole Lake Texcoco area. Lake Texcoco was a natural lake within the "Anahuac" or Valley of Mexico. Lake Texcoco is best known as where the Aztecs built the city of Tenochtitlan, which was located on an island within the lake. After the Spanish conquest of the Aztec Empire, efforts to control flooding by the Spanish led to most of the lake being drained. The entire lake basin is now almost completely occupied by Mexico City, the capital of the present-day nation of Mexico. Azcapotzalco is one of the 16 municipalities (municipios) into which Mexico's Mexico City is divided. Azcapotzalco is in the northwestern part of Mexico City. The town began in the pre-Hispanic era and was the seat of the Tepanec dominion until the Aztec Triple Alliance overthrew it. After that it was a rural farming area becoming part of the Federal District of Mexico City in the mid-19th century. In the 20th century the area was engulfed by the urban sprawl of Mexico City. Today it is 100% urbanized and is a center of industry. The Aztecs hired themselves out as mercenaries in wars between the Nahuas, breaking the balance of power between city states. Tenochtitlan, Texcoco, and Tlacopan formed a "Triple Alliance" that came to dominate the Valley of Mexico, and then extended its power beyond. Tenochtitlan, the traditional capital of the Aztec Empire, gradually became the dominant power in the alliance. The Chichimeca, a wide range of nomadic groups that inhabited the north of modern-day Mexico, were never conquered by the Aztecs. In 1519, the native civilizations of Mexico were invaded by Spain, and two years later in 1521, the Aztec capital Tenochtitlan was conquered. Francisco Hernández de Córdoba explored the shores of southeast Mexico in 1517, followed by Juan de Grijalva in 1518. The most important of the early Conquistadores was Hernán Cortés, who entered the country in 1519 from a native coastal town which he renamed "Puerto de la Villa Rica de la Vera Cruz" (today's Veracruz). In a series of wars and counter-rebellions over the next two centuries, Spain would expand and consolidate its Mexican territories. After a major battle in 1519, during which the Spanish forces were defeated and sent into retreat, the Spaniards regrouped outside the Valley of Mexico. After eight months they were back, this time with an even larger contingent of native allies. By then, Spanish smallpox had ravaged the Aztec population, drastically reducing the Aztec fighting forces. The Spaniards surrounded and laid siege to the inhabitants of Tenochtitlan, bringing about the Aztecs' total defeat in 1521. Despite their metal weapons, horses, dogs, cannons, and thousands of indigenous allies, the Spanish were unable to subdue the Mexica for seven full months. It was one of the longest continuous sieges in world history. Three major factors contributed to Spanish victory. First, the Spanish had superior military technology, including firearms, the bow and arrows, the crossbow, iron and steel weapons, the dog and the horse. The Spanish were further aided in their conquest by the Old World diseases (primarily smallpox) they brought with them, to which the natives had no immunity, and which became pandemic, killing large portions of the native population. Finally, the Spanish enlisted the help of various subject peoples in the Aztec Empire who saw the Spanish as a means to free themselves from Aztec rule, mainly the Tlaxcalans. The backgrounds to Mexico's struggle against Spain for its independence have been argued to have taken root as early as 1650, when an Irishman, William Lamport, attempted to revolt against Spanish rule in Mexico, cause an uprising among the Mexican people, and overwhelm any resistance of the Spanish. However, events in the late 18th and early 19th centuries may be best summed as to have caused the fight against the Spanish. The Criollos , or whites born in the Americas rather than in Spain, had been mistreated, while indigenous peoples and mestizos usually lived in dire poverty. Spain's debility at the start of the Napoleonic Wars, and an inability to control itself during its French occupation allowed several rebels to take advantage of the situation. Thus, leaders such as Simón Bolívar, José de San Martín and Antonio José de Sucre started revolutions throughout Latin America to attain independence. Mexico's War of Independence passed in a likewise manner and was acted out by founding father figures such as the priests Miguel Hidalgo and José María Morelos and the generals Vicente Guerrero, Guadalupe Victoria, and Agustín de Iturbide. The war for independence started on August 24, 1810, and was spearheaded by Miguel Hidalgo, a priest of Spanish descent and progressive ideas. After Napoleon I invaded Spain and put his brother on the Spanish throne, Mexican Conservatives and rich land-owners who supported Spain's Bourbon royal family objected to the comparatively more liberal Napoleonic policies. Thus an unlikely alliance was formed in Mexico: liberales, or Liberals, who favored a democratic Mexico, and conservadores, or Conservatives, who favored a Mexico ruled by a Bourbon monarch who would restore the old status quo. These two elements agreed only that Mexico must achieve independence and determine her own destiny. The war for independence lasted eleven years until the troops of the liberating army entered Mexico City in 1821. Thus although independence from Spain was first proclaimed in 1810, it was not formalized until 1821, under the Treaty of Córdoba, which was signed on September 16 in Córdoba, Veracruz, by the Spanish viceroy Juan de O'Donojú and Agustín de Iturbide, ratifying the Plan de Iguala. In 1821 Agustín de Iturbide, a former Spanish general who switched sides to fight for Mexican independence, proclaimed himself emperor – officially as a temporary measure until a member of European royalty could be persuaded to become monarch of Mexico (see First Mexican Empire for more information). 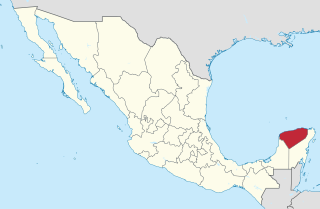 A revolt against Iturbide in 1823 established the United Mexican States. In 1824 Guadalupe Victoria became the first president of the new country; his given name was actually Félix Fernández but he chose his new name for symbolic significance: Guadalupe to give thanks for the protection of Our Lady of Guadalupe, and Victoria, which means Victory. The Plan de Casa Mata was formulated to abolish the monarchy and to establish a republic. In December 1822, Antonio López de Santa Anna and Guadalupe Victoria signed the Plan de Casa Mata on February 1, 1823, as a start of their efforts to overthrow Emperor Agustín de Iturbide. In May 1822, using military riots and pressures, Iturbide had taken the power and designated himself Emperor, initiating his government in fight with the Congress. Later he dissolved Congress and ordered opposing deputies to jail. Several insurrections arose in the provinces and were later crushed by the army. Veracruz was spared due to an agreement between Antonio López de Santa Anna and the rebel general Echávarri. By agreement of both heads the Plan de Casa Mata was proclaimed on February 1, 1823. This plan did not recognize the Empire and requested the meeting of a new Constituent Congress. The insurrectionists sent their proposal to the provincial delegations and requested their adhesion to the plan. In the course of only six weeks the Plan de Casa Mata had arrived at remote places, like Texas, and almost all the provinces had been united to the plan. Bombardment of San Juan de Ulúa off Veracruz in 1838. In 1838 a French pastry cook, Monsieur Remontel, claimed his shop in the Tacubaya district of Mexico City had been ruined by looting Mexican officers in 1828. He appealed to France's King Louis-Philippe (1773–1850). Coming to its citizen's aid, France demanded 600,000 pesos in damages. This amount was extremely high when compared to an average workman's daily pay, which was about one peso. In addition to this amount, Mexico had defaulted on millions of dollars worth of loans from France. Diplomat Baron Beffaudis gave Mexico an ultimatum of paying, or the French would demand satisfaction. When the payment was not forthcoming from president Anastasio Bustamante (1780–1853), the king sent a fleet under Rear Admiral Charles Baudin to declare a blockade of all Mexican ports from Yucatán to the Rio Grande, to bombard the coastal fortress of San Juan de Ulúa, and to seize the port of Veracruz. Virtually the entire Mexican Navy was captured at Veracruz by December 1838. Mexico declared war on France. The French withdrew in 1839. The Battle of San Jacinto in 1836, was a decisive battle that saw the end of de facto Mexican-rule over Texas. The Texan struggle for independence marked the beginning of a conflict with the modern U.S. state of Texas, and its independence from Mexico and the state of Coahuila y Tejas. Battles associated with the conflict with Texas include the Alamo, where federal troops led by Antonio López de Santa Anna defeated the Texans, and the Battle of San Jacinto, which allowed secession to take place. Revolts erupted throughout several states after Santa Anna's rise to power. The revolution in Texas began in Gonzales, Texas, when Santa Anna ordered troops to go there and disarm the militia. The war leaned heavily in favor of the rebels after they had won the Battle of Gonzales, captured the fort La Bahía, and successfully captured San Antonio (commonly called Béxar at the time). The war ended in 1836 at the Battle of San Jacinto (about 20 miles east of modern-day Houston) where General Sam Houston led the Texas army to victory over a portion of the Mexican Army led by Santa Anna, who was captured shortly after the battle. The conclusion of the war resulted in the creation of the Republic of Texas, a nation that teetered between collapse and invasion from Mexico until it was annexed by the United States of America in 1845. American military forces bombard Veracruz in 1847, during the siege of the city. The dominant figure of the second quarter of 19th century Mexico was the dictator Antonio López de Santa Anna. During this period, many of the territories in the north were lost to the United States. Santa Anna was the nation's leader during the conflict with Texas, which declared itself independent in 1836, and during the Mexican–American War (1846–48). One of the memorable battles of the U.S. invasion of 1847 was when a group of young Military College cadets (now considered national heroes) fought to the death against a large army of experienced soldiers in the Battle of Chapultepec (September 13, 1847). Ever since this war many Mexicans have resented the loss of much territory, some by means of coercion, and more territory sold cheaply by the dictator Santa Anna (allegedly) for personal profit. The Battle of Cerro Gordo in 1847. The battle saw American soldiers outflank Mexican soldiers. After the declaration of war, U.S. forces invaded Mexican territory on several fronts. In the Pacific, the U.S. Navy sent John D. Sloat to occupy California and claim it for the U.S. because of concerns that Britain might also attempt to occupy the area. He linked up with Anglo colonists in Northern California controlled by the U.S. Army. Meanwhile, U.S. army troops under Stephen W. Kearny occupied Santa Fe, New Mexico, and Kearny led a small force to California where, after some initial reverses, he united with naval reinforcements under Robert F. Stockton to occupy San Diego and Los Angeles. The main force led by Taylor continued across the Rio Grande, winning the Battle of Monterrey in September 1846. President Antonio López de Santa Anna personally marched north to fight Taylor but was defeated at the battle of Buena Vista on February 22, 1847. Meanwhile, rather than reinforce Taylor's army for a continued advance, President Polk sent a second army under U.S. general Winfield Scott in March, which was transported to the port of Veracruz by sea, to begin an invasion of the country's heartland. Scott won the Siege of Veracruz and marched toward Mexico City, winning the battles of Cerro Gordo and Chapultepec and occupying the capital. The Treaty of Cahuenga, signed on January 13, 1847, ended the fighting in California. The Treaty of Guadalupe Hidalgo, signed on February 2, 1848, ended the war and gave the USA undisputed control of Texas as well as California, Nevada, Utah, and parts of Colorado, Arizona, New Mexico, and Wyoming. In return, Mexico received $18,250,000 or the equivalent of $627,482,629 in today's dollars, total for the cost of the war. The Caste War lasted from 1847 to 1901, and began as a war of the Maya against the Yucatecos, a colloquial name for people of non-Maya ancestry that settled in the region. Nowadays "Yucatecos" is the demonym given to people who live in the Yucatán state. An oil painting depiction of the Caste War of Yucatán. The conflict was between the Maya people of the Yucatán, and the Mexican state. The Maya revolt reached its peak of success in the spring of 1848 by driving the Europeans from all the Yucatán Peninsula, with the exception of the walled cities of Campeche and Mérida and a stronghold between the road from Mérida and Sisal. The Yucatecan governor Miguel Barbachano had prepared a decree for the evacuation of Mérida, but was apparently delayed in publishing it by the lack of suitable paper in the besieged capital. The decree became unnecessary when the republican troops suddenly broke the siege and took the offensive with major advances. The majority of the Maya troops, not realizing the unique strategic advantage of their situation, had left the lines to plant their crops, planning to return after planting. Yucatán had considered itself an independent nation, but during the crisis of the revolt had offered sovereignty to any nation that would aid in defeating the Indians. The Mexican government was in a rare position of being cash rich from payment by the United States under the Treaty of Guadalupe Hidalgo for the territory taken in the Mexican–American War, and accepted Yucatán's offer. Yucatán was officially reunited with Mexico on 17 August 1848. European Yucateco forces rallied, aided by fresh guns, money, and troops from Mexico, and pushed back the Maya from more than half of the state. In the 1850s a stalemate developed, with the Yucatecan government in control of the north-west, and the Maya in control of the south-east, with a sparsely populated jungle frontier in between. In 1850, the Maya of the south east were inspired to continue the struggle by the apparition of the "Talking Cross". This apparition, believed to be a way in which God communicated with the Maya, dictated that the War continue. Chan Santa Cruz (Small Holy Cross) became the religious and political center of the Maya resistance and the rebellion came to be infused with religious significance. Chan Santa Cruz also became the name of the largest of the independent Maya states, as well as the name of the capital town. The followers of the Cross were known as "Cruzob". The government of Yucatán first declared the war over in 1855, but hopes for peace were premature. There were regular skirmishes, and occasional deadly major assaults into each other's territory, by both sides. The United Kingdom recognized the Chan Santa Cruz Maya as a de facto independent nation, in part because of the major trade between Chan Santa Cruz and British Honduras. Negotiations in 1883 led to a treaty signed on 11 January 1884 in Belize City by a Chan Santa Cruz general and the vice-Governor of Yucatán recognizing Mexican sovereignty over Chan Santa Cruz in exchange for Mexican recognition of Chan Santa Cruz leader Crescencio Poot as "Governor" of the "State" of Chan Santa Cruz, but the following year there was a coup d'état in Chan Santa Cruz, and the treaty was declared cancelled. The Revolution of Ayutla was an 1854 plan to overthrow the Santa Anna regime by the revolutionary Benito Juárez during his exile in New Orleans, Louisiana. The revolution sustained much support among intellectuals. This tension led to the final resignation of Santa Anna in 1855. Juan Ruiz de Álvarez led a provisional government after Santa Anna's final resignation, and the Revolution of Ayutla became one of the leading factors in the Reform War. In 1855 Ignacio Comonfort, leader of the self-described Moderates, was elected president. The Moderados tried to find a middle ground between the nation's Liberals and Conservatives. During Comonfort's presidency a new Constitution was drafted. The Constitution of 1857 retained most of the Roman Catholic Church's Colonial era privileges and revenues, but unlike the earlier constitution did not mandate that the Catholic Church be the nation's exclusive religion. Such reforms were unacceptable to the leadership of the clergy and the Conservatives, Comonfort and members of his administration were excommunicated and a revolt was declared. This led to the War of Reform, from December 1857 to January 1861. This civil war became increasingly bloody and polarized the nation's politics. Many of the Moderados came over to the side of the Liberales, convinced that the great political power of the Church needed to be curbed. For some time the Liberals and Conservatives had their own governments, the Conservatives in Mexico City and the Liberals headquartered in Veracruz. The war ended with Liberal victory, and Liberal president Benito Juárez moved his administration to Mexico City. The Battle of Puebla in 1862. The battle was an inspirational event for wartime Mexico, and slowed the French advanced to Mexico City. Events leading to conflict against the French in Mexico include debts Mexico owed to powerful European nations, especially Spain, Great Britain, and France. These nations supported European influence in Mexico as an economic, as well as a militaristic advantage. The United States had been engaged in its civil war and was therefore not able to attest to its Monroe Doctrine, a government policy that dictated that the North and South Americas would not be influenced anymore by European powers. 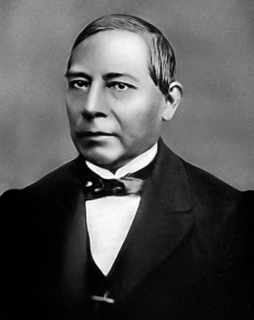 The presidential terms of Benito Juárez (1858–71) were interrupted by the Habsburg monarchy's rule of Mexico (1864–67). Conservatives tried to institute a monarchy when they helped to bring to Mexico an archduke from the Royal House of Austria, known as Maximilian of Habsburg (wife Carlota of Habsburg) with the military support of France, which was interested in exploiting the rich mines in the north-west of the country. Although the French, then considered one of the most efficient armies of the world, suffered an initial defeat in the Battle of Puebla on May 5, 1862 (now commemorated as the Cinco de Mayo holiday) they eventually defeated loyalist government forces led by General Ignacio Zaragoza and enthroned Maximilian as Emperor of Mexico. Maximilian of Habsburg favored the establishment of a limited monarchy sharing powers with a democratically elected congress. This was too liberal to please the Conservatives, while the liberals refused to accept a monarch, leaving Maximilian with few enthusiastic allies within Mexico. Maximilian was eventually captured and executed on the Cerro de las Campanas, Querétaro, by the forces loyal to President Benito Juárez, who kept the federal government functioning during the French intervention that put Maximilian in power. Mexican Imperialists engage Republican forces during the Battle of Miahuatlán in 1866. The battle occurred months after the French announced its withdrawal. In 1867, the republic was restored, and a new constitution was written that, amongst other things, confiscated the vast landholdings of the Catholic Church (which had been acting as landlord over half the country), established civil marriages and forbade the participation of priests in politics (separation of Church and State). After the victory, there was resentment by Conservatives against President Juárez (who they thought concentrated too much power and wanted to be re-elected) so one of the army's generals, named Porfirio Díaz, rebelled against the government with the proclamation of the Plan de Tuxtepec in 1876. Perhaps the most influential leaders in the conflict against the French were Benito Juárez and Ignacio Zaragoza. Zaragoza is remembered chiefly as the winner of the Battle of Puebla. When the French forces of Napoleon III invaded, Zaragoza fought them, first engaging the French at Acultzingo on April 28, 1862, where he was forced to withdraw. Zaragoza understood the favorable defensive position outside of the city of Puebla, where, with a force that was smaller and not as well equipped as the French, he beat back repeated French assaults on May 5. General Zaragoza and his command of 4,000 men defeated 8,000 men of Napoleon III's army at Puebla. This defeat was a great morale booster for the liberal Mexican army in the civil war that engulfed the country. The French then retreated to Orizaba. Benito Juárez began his military career as a liberal during the War of the Reform. He had opposed the French invasion at its start in 1861. Juárez later led opposition against the French puppet ruler, Maximilian I of Mexico, and refused a position of prime minister. Juárez was reinstated as president in 1867. The Mexican Revolution came about as a protest against the tyrannic and aging Porfirio Díaz, and to quell social and economic injustices as found under his regime. In 1910 the 80-year-old Díaz decided to hold an election to serve another term as president. He thought he had long since eliminated any serious opposition at home; however, Francisco I. Madero, an academic from a rich family, decided to run against him and quickly gathered popular support, despite Díaz's putting Madero in jail. When the official election results were announced, it was declared that Díaz had won reelection almost unanimously, with Madero receiving only a few hundred votes in the entire country. This fraud by the Porfiriato was too blatant for the public to swallow, and riots broke out. Madero prepared a document known as the Plan de San Luis Potosí, in which he called the people to take their weapons and fight against the government of Porfirio Díaz on November 20, 1910. Rebel soldiers partaking in urban warfare during the Ten Tragic Days. The Plan of San Luis Potosí started what is known as the Mexican Revolution. Madero was incarcerated in San Antonio, Texas, in the United States, but his plan took effect in spite of him being in jail. The Federal Army was defeated by the revolutionary forces which were led by, amongst others, Emiliano Zapata in the south, Pancho Villa and Pascual Orozco in the north, and Venustiano Carranza. Porfirio Díaz resigned in 1911 for the "sake of the peace of the nation" and went to exile in France, where he died in 1915. The revolutionary leaders had many different objectives; revolutionary figures varied from liberals such as Madero to radicals such as Emiliano Zapata and Pancho Villa. As a consequence, it proved very difficult to reach agreement on how to organize the government that emanated from the triumphant revolutionary groups. The result of this was a struggle for the control of the government in a conflict that lasted more than twenty years. This period of struggle is usually referred to as part of the Mexican Revolution, although it might also be looked on as a civil war. Presidents Francisco I. Madero (1911), Venustiano Carranza (1920), and former revolutionary leaders Emiliano Zapata (1919) and Pancho Villa (1923) were assassinated during this time, amongst many others. Following the resignation of Díaz and a brief reactionary interlude, Madero was elected President in 1911. He was ousted and killed in 1913 by the usurper Victoriano Huerta, following which many of the revolutionary armies again took up arms. Venustiano Carranza, a former revolutionary general who became one of the several presidents during this turbulent period, convened a constitutional convention that promulgated a new Constitution on February 5, 1917. The Constitution of 1917 remains in force to date. Depiction of soldaderas. Soldaderas were female soldiers who participated in the Revolution. In 1920, Álvaro Obregón became president. He accommodated all elements of Mexican society except the most reactionary clergy and landlords, and successfully catalyzed social liberalization, particularly in curbing the role of the Catholic Church, improving education and taking steps toward instituting women's civil rights. Soldaderas were women soldiers sent to combat among the men during the Mexican Revolution against the conservative Díaz regime to fight for freedoms. Many of these women led ordinary lives, but had taken arms during the time to seek better conditions and rights. Among the soldaderas Dolores Jiménez y Muro and Hermila Galindo are often considered heroines to Mexico today. Today, references to "La Adelita" are made as a symbol of pride among Mexican women. La Adelita was the title of one of the most famous corridos (folk songs) to come out of the Revolution, in which an unnamed revolutionary sang of his undying love for the soldadera Adelita. With the Revolution still being fought across the country, Mexico never declared war during the First World War. In addition to the internal conflict of the Revolution, it also experienced external pressures during the war, the most notable incidents being the Tampico Affair, the Pancho Villa Expedition, and the Zimmermann Telegram. 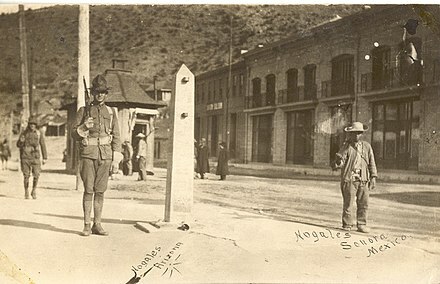 An American and Mexican soldiers guarding the border in Ambos Nogales during the Mexican Revolution. The city was the site of two separate engagements in the Border War, a series of military engagements along the border during the Revolution. 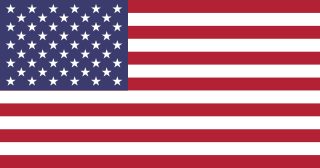 Tensions with the United States resulted in direct military conflict in several instances of varying severity. In addition, while Mexico rejected Germany's overtures to join in war on the United States, a telegram intercepted by the United Kingdom in 1917 hastened U.S. entry into World War I. On April 9, 1914, officials in the port of Tampico, Tamaulipas, arrested a group of U.S. sailors — including, crucially, at least one taken from on board a ship's boat flying the U.S. flag, and thus from U.S. territory. Mexico's failure to apologize in the terms demanded led to the U.S. navy's bombardment of the port of Veracruz and the occupation of that city for seven months. 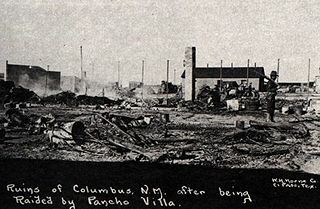 In 1916, Pancho Villa crossed the U.S. border and attacked the town of Columbus, New Mexico; this was the sole invasion by a foreign armed corps of the continental U.S. in the 20th century. This raid led the U.S. to send a force under General John Pershing into Mexico, which spent 11 months unsuccessfully chasing him in the punitive Pancho Villa Expedition (March 1916 – February 1917). The Zimmermann Telegram affair of January 1917, while it did not lead to direct U.S. intervention, also took place against the backdrop of the Constitutional Convention and exacerbated tensions between the USA and Mexico. However, following the 27 August 1918 Battle of Ambos Nogales, a skirmish between US Army and Villista troops, it was alleged that the bodies of two Germans were found among the dead. Since the United States and the German Empire were at war at the time, it is widely believed that the Germans were agents provocateurs tasked with instigating attacks against the United States. The mid 20th century was marked by the Cristero War, and Mexican involvement in World War II. Armed Cristeros congregating in the streets of Mexico. The Cristero War was a widespread rebellion against secularist, and anti-Catholic policies of the Mexican government. The struggle between church and state in Mexico broke out in armed conflict during the Cristero War (also known as the Cristiada) of 1926 to 1929. This was a popular uprising against the anti-clerical provisions of the Constitution of 1917. The Cristero War was brought about in response to the anticlerical laws of Plutarco Elías Calles. After a period of peaceful resistance, a number of skirmishes took place in 1926. The formal rebellion began on January 1, 1927 with the rebels calling themselves Cristeros because they felt they were fighting for Christ himself. Just as the Cristeros began to hold their own against the federal forces, the rebellion was ended by diplomatic means, in large part due to the efforts of U.S. Ambassador Dwight Whitney Morrow. The legacy of the Cristero War includes that of martyrdom, as several Cristeros, such as José Sánchez del Río and the Blessed Miguel Pro, were considered heroes for sacrificing their lives for the sake of the church. 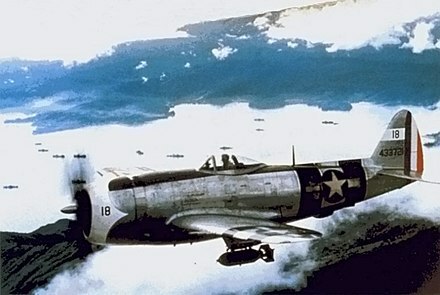 P-47D Thunderbolt of the Mexican 201st Fighter Squadron during World War II. Mexico declared war on the Axis Powers in support of the Allies on May 22, 1942, following losses of oil ships in the Gulf, most notably the Potrero del Llano and the Faja de Oro , to German submarine attacks. Although most American countries eventually entered the war on the Allies' side, Mexico and Brazil were the only Latin American nations that sent troops to fight overseas during World War II. In the civil arena, the Bracero Program gave the opportunity for many thousands of Mexicans to work in the USA in support of the war effort. This also granted them an opportunity to gain US citizenship by enlisting in the military. On December 31, 1958, Mexican fishing boats were attacked by the Fuerza Aérea Guatemalteca (FAG) in the territorial waters of Guatemala. Three fishermen were killed and fourteen injured. Ten of the survivors were subjected to interrogation by the Guatemalan military. The situation caused a temporary termination of diplomatic relations and trade between Mexico and Guatemala, a border bridge was destroyed and the two countries put their militaries on alert. One recent event in the military history of Mexico is that of the Zapatista Army of National Liberation, which is an armed rebel group that claims to work to promote the rights of the country's indigenous peoples. The Zapatistas had the initial goal of overthrowing the federal government. Short armed clashes in Chiapas ended two weeks after the uprising and there have been no full-scale confrontations ever since. The federal government instead pursued a policy of low-intensity warfare with para-military groups in an attempt to control the rebellion, while the Zapatistas developed a media campaign through numerous newspaper comunicados and over time a set of six "Declarations of the Lacandonian Jungle", with no further military or terrorist actions on their part. A strong international Internet presence has prompted the adherence to the movement of numerous leftist international groups. President Ernesto Zedillo (1994–2000) refused most of the demands of the rebels. In September 2005 Mexican army convoys traveled to the U.S. to help in the Hurricane Katrina relief effort. Mexican army convoys and a navy ship laden with food, supplies and specialists traveled to the United States including military specialists, doctors, nurses and engineers carrying water treatment plants, mobile kitchens, food and blankets. The convoy represents the first Mexican military unit to operate on U.S. soil since 1846, when Mexican troops briefly marched into Texas, which had separated from Mexico and joined the United States. All of the convoy's participants were unarmed. Recently, controversy has also sparked due to Mexico's involvement of sending troops to United Nations forces. Mexican soldiers raid a house reportedly owned by the Gulf Cartel in 2012. In recent times, the Mexican military has largely participated in efforts against drug trafficking. The Operaciones contra el narcotrafico (Operations against drug trafficking), for example, describes its purpose in regards to "the performance of the Mexican Army and Air Force in the permanent campaign against the drug trafficking is sustained properly in the faculties that the Executive of the Nation grants to him, the 89 Art. Fracc. 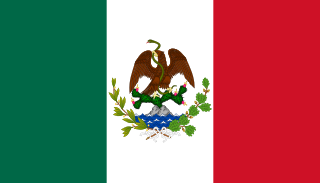 VI of the Constitution of the Mexican United States, when indicating that it is faculty of the President of the Republic to have the totality of the permanent Armed Forces, that is of the terrestrial Army, Navy military and the Air Force for the inner and outer security of the federation." 1519: Hernán Cortés lands at Veracruz. In 1521 Cortés and his indigenous allies conquer Tenochtitlán, the Aztec capital. 1808: Napoleon dethrones the Spanish king, Charles IV, stimulating political unrest throughout Spain’s empire. 1810–c. 1821: During wars of independence that pit Mexicans against one another as well as the forces of Spain, over 12 percent of the Mexican population dies. Independence is achieved under the 1821 Plan of Iguala, which promises equality for citizens and preserves the privileges of the Catholic Church. 1835: Rebels seeking independence for Texas fight the regular army at the Alamo. In 1836 the Texas Republic becomes independent. 1837–1841: Revolts favoring federalism over the centralizing constitution imposed by Antonio López de Santa Anna in 1836 occur in much of Mexico. 1845: The United States annexes Texas. 1846–1848: Mexico and the United States are at war. In the resulting treaty of Guadalupe-Hidalgo, Mexico recognizes the loss of Texas and cedes parts or all of what are now the U.S. states of New Mexico, Arizona, Utah, Colorado, Nevada, Montana, and California to the United States. 1847: The start of the Caste War. 1854: Mexico sells 77,700 km² (nearly 30,000 square miles) of northern Sonora and Chihuahua to the United States in the Gadsden Purchase. 1854–1861: Benito Juárez and other liberals overthrow Santa Anna (Revolution of Ayutla). The liberal reforms they inaugurate encourage division of Indian and church lands into private holdings, subject clergy and military to regular courts, and establish religious freedom. 1857: Constitution re-establishes a federal republic and, moving beyond the Constitution of 1824, guarantees the individual rights of free speech, assembly, and press. In 1858–1861 supporters and opponents of the reforms fight the War of the Reform, which ends in liberal victory. 1862–1867: The French emperor Napoleon III, in alliance with conservative and proclerical Mexicans, installs Maximilian of Habsburg as emperor of Mexico. On May 5, 1862, loyalist troops defeat Napoleon III’s troops at Puebla. (The holiday Cinco de Mayo honors this victory.) In 1867 Juárez’s forces defeat and execute Maximilian. 1876–1911: The Porfiriato, the authoritarian regime of the longtime president Porfirio Díaz, maintains the liberal economic policies and secularization achieved under Juárez and encourages foreign investment. 1901: End of Caste War. 1910–1917: Spurred by discontent with the dictatorial Díaz regime, regional animosities, and increasing economic inequality in the countryside, guerrilla armies fight the Mexican Revolution, temporarily breaking the country into warring regions. 1914: United States forces occupy the port city of Veracruz for seven months. 1916: United States President Woodrow Wilson orders Gen. John Pershing to capture guerrilla leader Pancho Villa after Villa’s attack on Columbus, New Mexico. For nine months 4,000 American troops search in vain for Villa. 1917: The Constitution of 1917 maintains republican and liberal features of the 1824 and 1857 constitutions but also guarantees social rights such as a living wage. It nationalizes mineral resources and prohibits foreign businessmen from appealing to their home governments to protect their property. Amended many times, this constitution remains in force. 1926: Conflict over the 1917 Constitution’s provisions for separation of church and state leads to nationalization of church property and armed rebellion, which the government suppresses. This period is known as the Cristero War. 1942: Mexico enters World War II, on the side of the Allied Powers. 1994: The Zapatista rebellion in Chiapas protests the PRI’s dominance of political power and the government’s indifference to the fate of peasants and indigenous peoples. The Texas Revolution was a rebellion of colonists from the United States and Tejanos in putting up armed resistance to the centralist government of Mexico. While the uprising was part of a larger one that included other provinces opposed to the regime of President Antonio López de Santa Anna, the Mexican government believed the United States had instigated the Texas insurrection with the goal of annexation. The Mexican Congress passed the Tornel Decree, declaring that any foreigners fighting against Mexican troops "will be deemed pirates and dealt with as such, being citizens of no nation presently at war with the Republic and fighting under no recognized flag." Only the province of Texas succeeded in breaking with Mexico, establishing the Republic of Texas, and eventually being annexed by the United States. A caudillo was a type of personalist leader wielding military and political power. There is no precise definition of caudillo, which is often used interchangeably with "dictator" and "strongman". The term is historically associated with Spain, and with Spanish America after virtually all of that region won independence in the early nineteenth century. The term is often used pejoratively by critics of a regime. However, Spain's General Francisco Franco (1936–1975) proudly took the title as his own during and after his military overthrow of the Second Spanish Republic in the Spanish Civil War (1936–39), in parallel to the German, Italian, and Japanese equivalents of the same period: Führer, Duce, and Tenno. Spanish censors during his rule attacked publishers who applied the term to Hispanic American strongmen. Caudillos' exercise of power is a form considered authoritarian. Most societies have had personalist leaders at times, but Hispanic America has had many more, the majority of whom were not self-described caudillos. However, scholars have applied the term to a variety of Hispanic American leaders. The Treaties of Velasco were two documents signed at Velasco, Texas on May 14, 1836, between Antonio Lopez de Santa Anna of Mexico and the Republic of Texas, in the aftermath of the Battle of San Jacinto on April 21, 1836. The signatories were Interim President David G. Burnet for Texas and Santa Anna for Mexico. The treaties were intended, on the part of Texas, to provide a conclusion of hostilities between the two enemies and to offer the first steps toward the official recognition of the breakaway republic's independences. 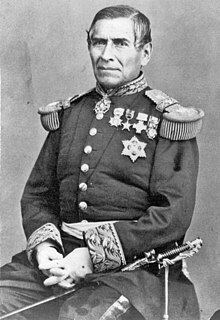 Juan Nepomuceno Álvarez Hurtado de Luna, generally known as Juan Álvarez, was a general, long-time caudillo in southern Mexico, and interim president of Mexico for two months in 1855, following the liberals ouster of Antonio López de Santa Anna. Álvarez had risen to power in the Tierra Caliente, in southern Mexico with the support of indigenous peasants whose lands he protected. He fought along with heroes of the insurgency, José María Morelos and Vicente Guerrero in the War of Independence, and went on to fight in all the major wars of his day, from the "Pastry War", to the Mexican–American War, and the War of the Reform to the war against the French Intervention. A liberal reformer, a republican and a federalist, he was the leader of a revolution in support of the Plan de Ayutla in 1854, which led to the deposition of Santa Anna from power and the beginning of the political era in Mexico's history known as the Liberal Reform. "Álvarez was most important as a champion of the incorporation of Mexico's peasant masses into the polity of [Mexico] ... advocating universal male suffrage and municipal autonomy." Juan Nepomuceno Almonte was a 19th-century Mexican official, soldier and diplomat. He was a veteran of the Battle of the Alamo during the Texas Revolution. Almonte was also a leader of Mexico's Conservatives in the 1860s and served as regent after the Second Mexican Empire was established by Napoleon III of France. La Reforma or the Liberal Reform was initiated in Mexico following the ousting of centralist president Antonio López de Santa Anna by a group of liberals under the 1854 Plan de Ayutla. From the liberals' narrow objective to remove a dictator and take power, they expanded their aims to a comprehensive program to remake Mexico governed by liberal principles as embodied by a series of Reform laws and then the Constitution of 1857. The major goals of this movement were to undermine the power of the Catholic Church in Mexico, separate church and state, reduce the power of the Mexican military, and integrate Mexico's large indigenous population as citizens of Mexico and not a protected class. Liberals envisioned secular education as a means to create a Mexican citizenry. The liberals' strategy was to sharply limit the traditional institutional privileges (fueros) of the Catholic Church and the army. The law prohibiting the ownership of land by corporations targeted the holdings of the Catholic Church and indigenous communities - confiscating Church land. Indigenous community lands were held by the community as a whole, not as individual parcels. Liberals sought to create a class of yeoman farmers that held land individually. No class of individualistic peasants developed with the Liberal program emerged, but many merchants acquired land. Many existing landowners expanded their holdings at the expense of peasants, and some upwardly mobile ranch owners, often mestizos, acquired land previously held by communities. Upon the promulgation of the liberal Constitution of 1857, conservatives refused to swear allegiance to it and, instead, formed a conservative government. The result was a civil war known as the Reform War or Three Years' War, waged between conservatives and liberals for three years, ending with the defeat of the conservatives on the battlefield. Victorious liberal president Benito Juárez could not implement the envisioned reforms due to a new political threat. Conservatives had sought another route to regaining power, resulting in their active collaboration with Napoleon III's plans to turn the Mexican Empire into the main American ally of the French empire. Mexican conservatives offered the crown of Mexico to Hapsburg archduke Maximilian. The French invasion and republican resistance to the French Intervention in Mexico lasted from 1862-67. With the defeat of the conservatives and the execution of Maximilian, Juárez again took up his duties as president. In this period from 1867 to 1876, often called the "Restored Republic" liberals had no credible opposition to their implementation of the laws of the Reform embodied in the 1857 Constitution. The Plan of Ayutla was the 1854 written plan aimed at removing conservative, centralist President Antonio López de Santa Anna from control of Mexico during the Second Federal Republic of Mexico period. Initially, it seemed little different than other political plans of the era, but it is considered to be the first act of the Liberal Reform in Mexico. It was the catalyst for revolts in many parts of Mexico, which led to the resignation of Santa Anna from the presidency, never to vie for office again. The next Presidents of Mexico were the liberals, Juan Álvarez, Ignacio Comonfort, and Benito Juárez. The new regime would then proclaim the 1857 Mexican Constitution, which implemented a variety of liberal reforms. In Mexican history, a plan was a declaration of principles announced in conjunction with a rebellion, usually armed, against the central government of the country. Mexican plans were often more formal than the pronunciamientos that were their equivalent elsewhere in Spanish America and Spain. Some were as detailed as the United States Declaration of Independence, though some plans merely announced that the current government was null and void and that the signer of the plan was the new president. The United States involvement in the Mexican Revolution was varied and seemingly contradictory, first supporting and then repudiating Mexican regimes during the period 1910-1920. For both economic and political reasons, the U.S. government generally supported those who occupied the seats of power, whether they held that power legitimately or not. A clear exception was the French Intervention in Mexico, when the U.S. supported the beleaguered liberal government of Benito Juárez at the time of the American Civil War (1861-1865). Prior to Woodrow Wilson's inauguration on March 4, 1913, the U.S. Government focused on just warning the Mexican military that decisive action from the U.S. military would take place if lives and property of U.S. nationals living in the country were endangered. President William Howard Taft sent more troops to the US-Mexico border but did not allow them to intervene in the conflict, a move which Congress opposed. Twice during the Revolution, the U.S. sent troops into Mexico. Antonio de Padua María Severino López de Santa Anna y Pérez de Lebrón, often known as Santa Anna or López de Santa Anna, was a Mexican politician and general who fought to defend royalist New Spain and then for Mexican independence. He greatly influenced early Mexican politics and government, and was an adept soldier and cunning politician, who dominated Mexican history in the first half of the nineteenth century to such an extent that historians often refer to it as the "Age of Santa Anna." He was called "the Man of Destiny", who "loomed over his time like a melodramatic colossus, the uncrowned monarch." Santa Anna first opposed the movement for Mexican independence from Spain, but then fought in support of it. Though not the first caudillo of modern Mexico, he "represents the stereotypical caudillo in Mexican history," and among the earliest. 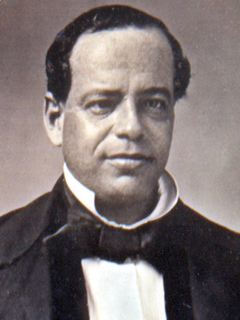 Conservative historian, intellectual, and politician Lucas Alamán wrote that "The history of Mexico since 1822 might accurately be called the history of Santa Anna's revolutions.... His name plays the major role in all the political events of the country and its destiny has become intertwined with his." ↑ "In historic U-turn, Mexico to join U.N. peacekeeping missions". Reuters. Reuters. September 24, 2014. Retrieved June 5, 2018. ↑ "IContributors to UN Peacekeeping Operations by Country and Post" (PDF). 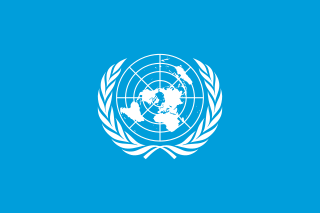 United Nations Peacekeeping. United Nations. April 30, 2018. Retrieved June 5, 2018. 1 2 Minster, Christopher (April 16, 2018). "Mexican Involvement in World War II". ThoughtCo.com. ThoughtCo. Retrieved June 4, 2018. ↑ Aviation History (June 12, 2006). "World War II: Mexican Air Force Helped Liberate the Philippines". HistoryNet.com. World History Group. Retrieved June 4, 2018.